It’s back to school time and that means the carefree time of summer is over and it’s time to get things in order. Now that there are schedules to keep, papers to file, and back packs to maintain, an organization system needs to be in place. I have some back to school organizing ideas that should help to keep all of that chaos orderly at home so that there is limited frustration during the school year. Some of the ideas are big, like furnishings and storage systems, and others are small and easy to implement. To start with, kids need a place to go with their backpacks, coats, shoes, etc.. They have lockers and school so why not have lockers at home? If you have the space, these are an awesome addition. You can find old lockers on Craig’s list or Ebay from old schools and companies. I have also seen them in antique stores although for usually a little pricier amount. 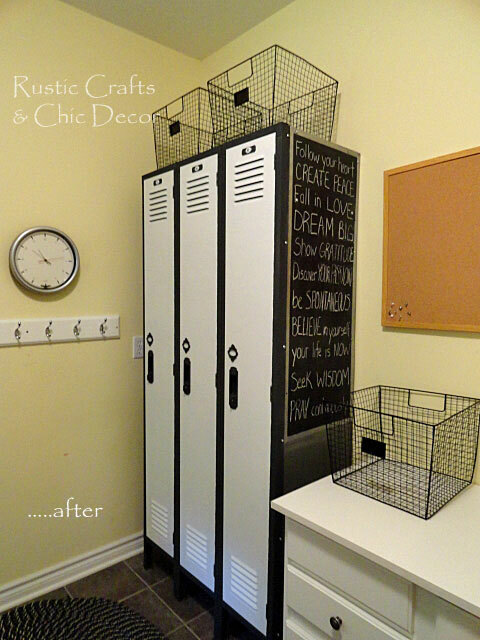 See how I took these old shop lockers and made them over at my DIY Locker Makeover. Kids bring home a lot of papers! Most likely there will be some important ones that you will not want to have left stuffed in that back pack. So…having a separate spot designated for each child’s paperwork is a must. 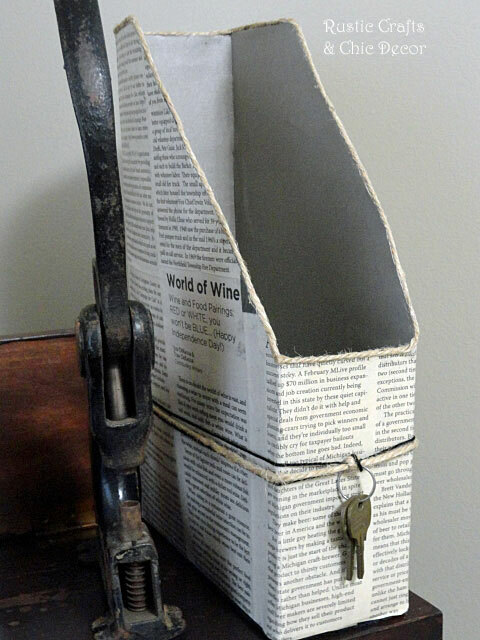 Instead of purchasing a generic file though, you and your child could create your own paper holder out of a cereal box. 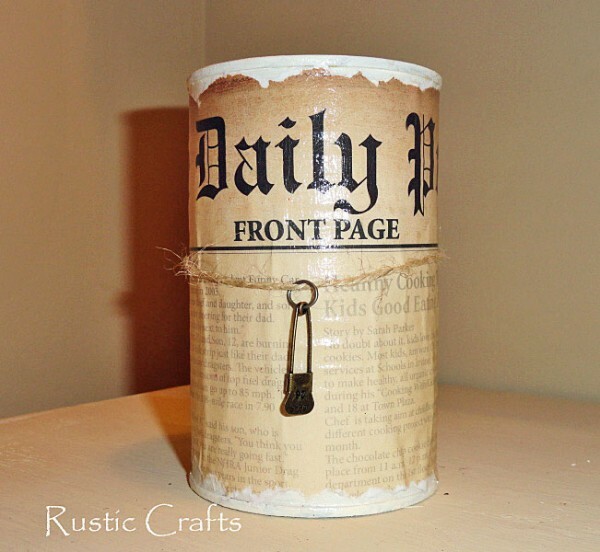 Find the easy tutorial for my cereal box paper holder here. The holder can be customized any way you want it. How about having a spot for lots of pens and pencils? You can easily make a decorative holder for those too out of none other than an old or mismatched drinking glass. 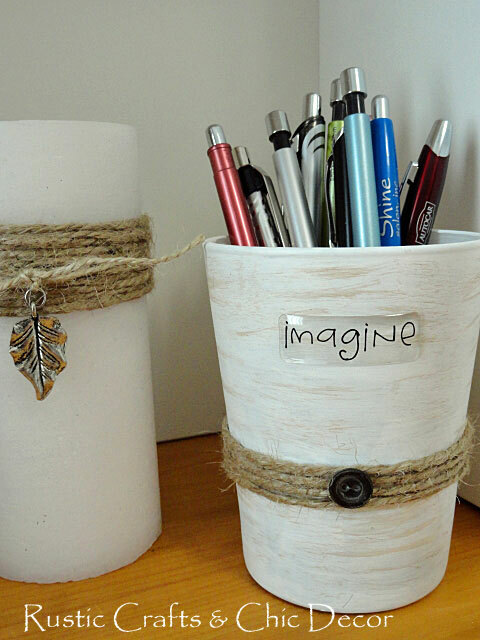 This craft is really easy to make using my Pencil Holder Craft Tutorial. If you don’t have a drinking glass to spare, try one of my Can Crafts. 1. Have a large bulletin board or chalkboard hung in a hallway or other prominent area to keep track of important notes and reminders. 2. Post a schedule or calendar inside home locker, cabinet door, or hallway wall. 3. Hooks on the walls are an easy way to keep back packs and jackets off the floor. A boot tray keeps shoes and boots contained and floors clean. 4. A large storage cube placed in a closed, shelf or counter is also an easy solution for keeping each child’s belongings contained.